In this scene from the end of the opera, The Count (James Lesu'i, a graduate student at The Boston Conservatory) begs the forgiveness of his Countess (Christina Bianco ’17). This weekend, the curtains will open in Agassiz Theatre to reveal a series of tall gray arches, set against a painted backdrop of a sky that looks borrowed from Magritte. Far above the heads of the singers in the Harvard College Opera’s Le Nozze di Figaro, a partially lowered screen shows the English translation of their characters’ laments, squabbles, and prevarications. The mistaken identity, cross-dressing comedy is a standby for the all-student group, which turns 25 this year. Every half-decade or so, they reincarnate Figaro. 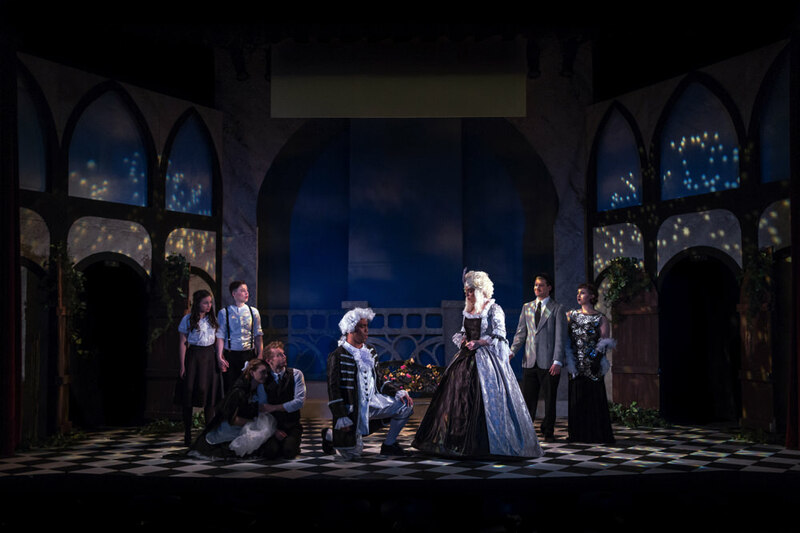 In the interval since the ensemble’s “not to be missed” staging in 1996 (as reviewed  by this magazine’s contributing editor Adam Kirsch ’97), Mozart’s quick-witted groom-to-be has been transported to 1930s America, the Kennedys’ Camelot, and elsewhere. But all four prior productions were sung in English, which makes this year’s performance in the original Italian seem like a departure. Yet when the organization first known as the Dunster House Opera Society (DHO) began in 1992, it put on Georges Bizet’s Carmen entirely in French. Ethan Sperry ’93 started the group after an unsuccessful interview to direct music for the Lowell House Opera, at which he proposed that their show, which typically drew lead singers from Boston-area conservatories, be sung and staffed entirely by Harvard students. He and classmate Melika Fitzhugh ’94 then won the support of the heads of Dunster House to stage Bizet’s hit opera in the dining hall. Auditions were held in November, and the cast was instructed to learn music over winter break. The production was put together over some 23 days. On opening night, Sperry introduced Carmen as “the first annual production of the Dunster House Opera Society.” “I can be a really flippant person when I talk to audiences,” he allows. “It was a hope, not a guarantee.” But the next year, Freidenfelds produced Die Fleidermaus, by Johann Strauss II,and her stage directors put on Puccini’s Gianni Schicchi and La Rondine in 1995. In time, enough momentum built up for the society to become firmly rooted in the College extracurricular scene. Its traditions have shifted, the frenzy of intersession rehearsals giving way to a calmer January term schedule, and the emphasis on English-language performance going in and out of fashion. But a little of the brashness, and much of the camaraderie, has remained. Composer and conductor Matt Aucoin ’12  had a similar experience. “At DHO, we were all in it together,” he says. “Everybody has to sort of do everything, and it was all hands on deck.” The opera gave him his first hands-on conducting experience—and his senior year, someone from the Met attended the students’ production of Figaro, which led to an audition and a job as an assistant conductor. This story has been edited on February 6 to reflect that Melika Fitzhugh was a member of the Harvard Wind Ensemble, not the Harvard-Radcliffe Orchestra.